This set of six chocolate ganaches was available at Chocolate Unwrapped and I managed to buy not just one but TWO of these beauties. There is a shipment which is totally limited and for sale at the Maltby Street Market from 9am-2pm this Saturday at Catalan Cooking’s stall so rush down and if you’re very lucky, the larger £12 size may be on offer as well! As for these ganaches, I thought I would do a quick description of them since I’ll be eating them anyway and maybe if you are inspired you can support a master artisan and buy his chocolates (also helping my good friend who imported them at great risk so she breaks even). Daintree Estates: a kind of molasses sugar flavour but this is a dark chocolate with a malty edge. OMG I could eat a bucket of these chocolates! Madre Chocolate: milk on the outside, dark on the inside this has a peppery flavour like pink peppercorns with the chocolate. Nice and a bit different for sure. The jelly was an interesting surprise! 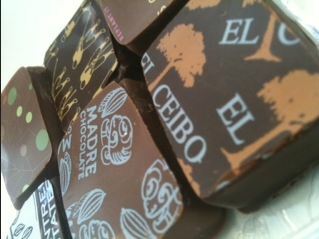 El Cibo: Kind of weird granular mouth feel with a nose of nibs – probably because there are nibs in this one! Golf Player – I dunno what this is except that it is a praline that seems to have feullitine in it or maybe just sugar crystals. I’m not a praline person and this one is STRONG! Dots: Another praline this is actually really smooth. Still really sweet but none of the crunchiness I got in the golf player one. Overall, I’d scoff 4 of the 6 in minutes flat. The pralines I’m not as keen on but hey ho! TO WIN A BOX just leave a comment with your idea about which ethical chocolate ganache you would add to the box. It can be flavoured, unflavoured or wacky but it must be ethical and you need to name it like Askinosie (they buy direct from farmers), Divine (co-operative of farmers in Ghana), Pierre Marcolini (for buying direct from farmers), Demarquette (for buying direct from farmers and helping kids), etc. 1.The competition will finish at noon GMT on Friday 19th October 2012. 2.The selection of winner will be based on originality of chocolate selected and any flavour pairings. Any which include chocolate which is not ethical will be discounted. A milk chocolate ganache with fairtrade honey is pretty hard to beat. Marc Demarquette’s Ben Tre is a good single estate ethical one to use. A buttery peanut ganache with Divine chocolate, smooth bit slightly bitter Yummy. I would add a ganache made from Askinosie Ecuador chocolate just plain because it is perfect the way it is. A good ethical dark chilli chocolate ganache made with Green & Blacks Maya chocolate, coconut milk instead of cream. I’m a huge fan of chocolate & fruit combinations so I think that’s what’s missing. Something like Coeur Framboise from Pierre Marcolini (raspberry ganache with lemon zest – I think that’s the loveliest combination). butterscotch ganache made by Askinosie because they cut of the middle man+buy products directly from the the seller. I’m all for supporting kids and fairtrade, so my choice would be a Demarquette sea salt praline ganache (sorry, but i love pralines). i think the sea salt would be beautiful with the creamy ganache. I would love the sea salt to be quite grainy too, to give texture. It could go well with the Madre Chocolate in the selection! A Darkly Divine pecan pie filling ganache. A Luscious bitter/sweet contrast.